When it comes to jewelry, nowhere is there more interest in unique wearable art. The relatively new trend of “Fantasy and Concave Cut” gemstones gives the gemstone cutter a whole new horizon to create and explore his craft. This emerging art form is producing highly innovative concepts in contemporary jewelry design. It is also leading to some of the most stunning and creative work in gem cutting today. Fantasy and Concave Cuts are in high demand, in part because there are still relatively few gem cutters who can produce this unique art form. Fantasy and Concave Cuts can be made on any gemstone. These unique cuts involve the creative use of refracted light through a gemstone to form unusual effects. Refraction, or the reflection of light as it travels through a gem, can be greatly increased by adding more surfaces (facets). As the gem cutter adds grooves or concave facets in the stone, the light reflects back in entirely new ways. 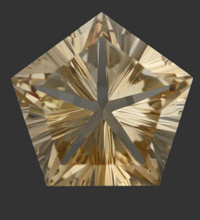 This results in designs not possible using traditional cutting techniques–pieces that are truly distinctive–with no two exactly alike. Another key benefit of Fantasy and Concave Cutting is that it can increase a gem’s brilliance by 5-7 times. Fantasy and Concave Cuts may be any shape, including traditional cuts (e.g. round, oval, pear, etc. ), and often feature unique free-form shapes. These cuts range from simple geometric shapes to more complex shapes, such as fan, kite, pentagon, half-moon, hexagon, chevron, etc. The refracted light, meanwhile, can result in highly artistic images that appear when the gemstone is viewed. The faceter’s only limitation is their imagination! Perhaps it isn’t exactly accurate to say that a faceter’s ONLY limitation is imagination. Doing Fantasy / Concave Cuts well requires a good understanding of the properties of the gem, such as knowing how to orient the stones, work with its grain, cleavage, inclusions, refractive index and angles, etc. One of the most important requirements for a good faceter is having the right equipment. The emergence of Fantasy and Concave Cuts dates to the 1980s–nearly 30 years ago. Although there was interest in the new art form at that time, the technology didn’t exist to do it well, and the trend never really took off. That is changing, however. With highly sophisticated equipment now available such as the Ultra Tec Fantasy Machine, faceters can now acquire the advanced tools to perform some of the most difficult Fantasy and Concave Cuts. However, many gem cutters can’t or aren’t willing to invest in them. 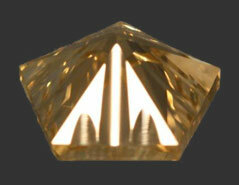 Front side of the Citrine Morgan’s Star Fantasy / Concave Cut stone. Back side of the Fantasy / Concave Cut Citrine Morgan’s Star with concave, grooved cuts that produce the added brilliance of this stone.